I have now made the hat/beret I said I was going to earlier. The yarn is actually dark blue, not black (don't know what light I was looking at it in before). I think it has turned out quite well. It is about the right size for an average woman's head (or a volley ball, which is what I used to model it on for the photo!). It has used about half of the cake of yarn and I am now trying to decide whether to make another beret the same, a different hat, or a pair of fingerless gloves to make a set. Any ideas? Anyone fancy buying this beret for about £8.00 (plus P&P - see note to left)? I love that beret! I always end up coveting cute hats but never owning any because I never look good in a hat. The yarn is really lovely too. Thanks for the pastry tip on my blog, by the way. Next time I make a pie (and who knows when that will be) I'll try using spelt flour. Thanks for your kind comment Emma. 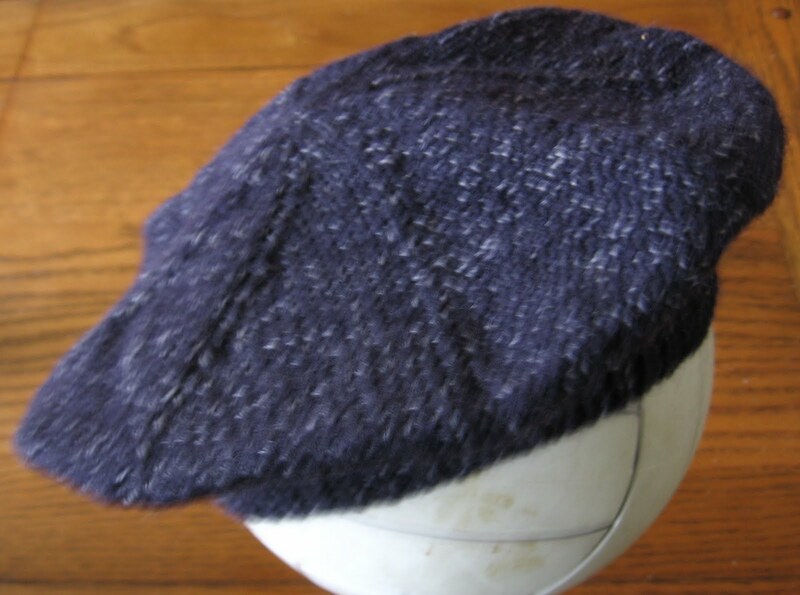 This beret has now found a home, but I could still do another similar one, should anyone want.